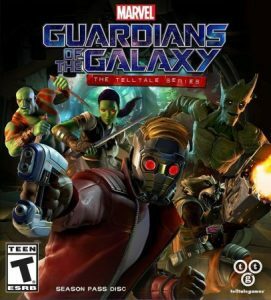 Telltale games takes another critically acclaimed franchise under their wing (Guardians of the Galaxy) bringing us what seems to be the best storytelling in the video game industry. In episode 1 you begin on the guardian’s ship and are looking to take down Thanos the galaxies most notorious criminal, you get shot down on a strange planet in the kree district which Thanos has stolen an artifact from. The Guardians continue to pursue Thanos through which seems to be a temple of some sort, from there the Guardians have a very intense battle and end up killing Thanos with a gun that Rocket claims he made. After killing Thanos it was time to celebrate with drinks and social gatherings at a bar, having conversations with your colleagues and just having a good time, waking up from having too much to drink you and your crew are trying to decide what to do with the corpse of Thanos; you have two options of taking it to a collector who will pay you top dollar on Rockets recommendation or take it to the nova corps on Gamora’s recommendation. Whatever decision you make Hala will ambush your team and take the artifact you retrieved from Thanos, you then pursue her to her ship with either Drax or Gamora as you get there you will have a confrontation conversation with Hala which ends up getting Star-Lord stabbed and being seriously injured and ends up on the verge of death, but this artifact has some weird powers and his mother somehow brings him back to life even though his mother is dead.